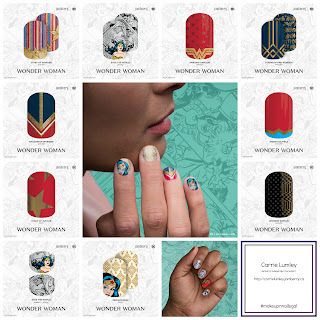 Your Makeup'n'Nails Gal: Jamberry - What is it? Jamberry - What is it? I hope all is well with you! As you know, I am in Direct Sales and am constantly learning! I am always looking for ways to better myself so that I can be the best I can be for my customers. I hope you have been enjoying the posts on my blog. I am trying to help by telling you of my experiences in this business. I hope that I have been able to help a little bit anyway. Today I wanted to tell you a little bit about Jamberry and the products that I love! But first I wanted to let you know that they have released a new line just in time for the Wonder Woman movie. They are so cute! Just look at them!! They even have ones for your little girls!! 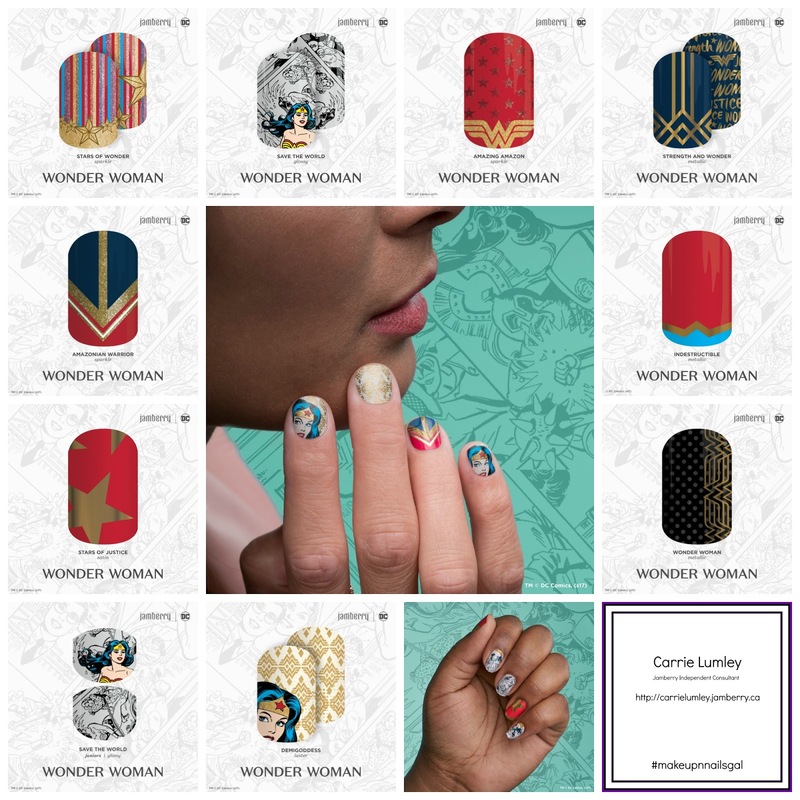 First and foremost, the main product of Jamberry is the nail wraps. Of course we offer many different products to care for your hands and feet. We continue to add more products to our line. This company came about after an expensive day at the salon for the Jamberry founders. They knew there had to be a more affordable way for them to do fabulous mani's and pedi's at home. All this at salon quality. This idea came about in the living room of the founders home. From small beginnings to now over 300 designs plus many other fun products. Not only have they considered adults but they have junior sizes for children. They even have adult wraps that match junior sizes for Mommy and Me. (or grandma and me). How cute is that? These wraps are addictive (I can truthfully attest to that), but they have zero dry time, no harmful chemicals nor do they chip! They will last up to 2 weeks on your finger nails and 4 weeks on your toes. How cool is that? The only problem with that is (and it is MINOR) I want to change the wraps before the two week mark! LOL. The wraps are made in the USA, are vegan and gluten-free for those who require that! The reason they last so long is because they are heat-activated and pressure-sealed. They are simple to apply. Of course with anything that you do for the first time, it will take some practice but I promise you, it is not hard! Feeling creative? We have a Nail Art Studio where you can design your own wraps!!! Once approved, you can purchase your designs. We also have lacquer and gel enamel. The colour selection is amazing! They co-ordinate with the colours in our wraps. We are now 8 free!!!! They do not contain harmful chemicals! We have a complete line of hand and foot care. Check out my site here to see for yourself all the options available to you! You can find me on YouTube, Pinterest, Facebook, Twitter and Instagram using #makeupnnailsgal.